Let face it. Raking is drudgery. It takes a long time…seemingly forever! It’s hardly a skill that you can take pride in. And oftentimes wind or rain will thwart your best efforts. 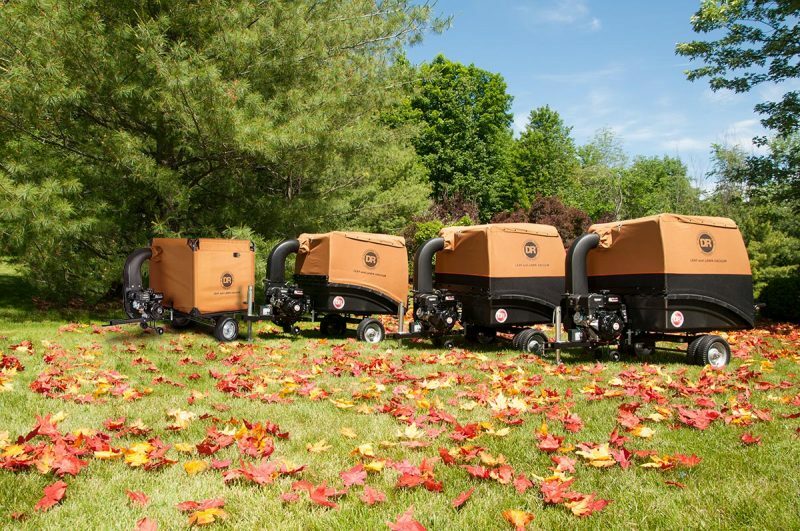 So it’s no surprise that Leaf Vacuums are growing in popularity. But how do you choose among the available options out there? Start by looking at your lawn mower. 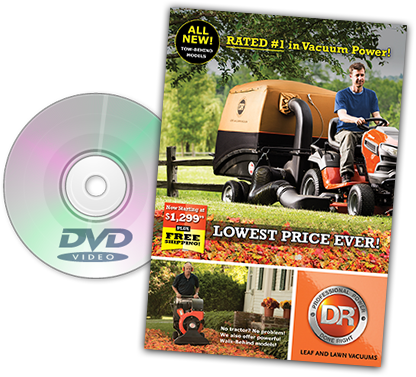 Many people—maybe you’re one of them—rake their leaves into a big pile, then run them over repeatedly with their mower. Getting those mulched leaves off your lawn is another story. With a walk-behind mower, you can use a bagger…but you’ll fill it up in no time at all. Then you spend all your time traipsing back and forth between your mower and a dump pile. More drudgery. Unloading is easy…just drive to your chosen spot, and dump up to 315 gallons at a time. It’s fast and easy. Below you’ll find a comparison of the available DR models. First, in the springtime you are likely to have a messy yard. Sticks and branches, matted leaves (especially if you didn’t vacuum them up in the fall), windblown materials…even droppings from four-footed visitors. The DR does a great job cleaning it all up—power raking it—and bringing your yard back to life. And here’s the kicker that you’ll really come to appreciate: The cloth leaf collection container removes quickly and collapses to a compact bundle. The engine rolls away on its own built in trolley. And what remains is a utility trailer that you can use for hauling all sorts of materials around your property: fertilizer, feed bags, lumber, building materials, tools, you name it. Want to learn more about DR Leaf and Lawn Vacs?